American students know surprisingly little about the heroic actions that made basic civil rights protections a reality in America. Thirty-four U.S. states recently received an F or D grade for their civil rights education programs, according to a national study. But now civil rights icon and veteran U.S. 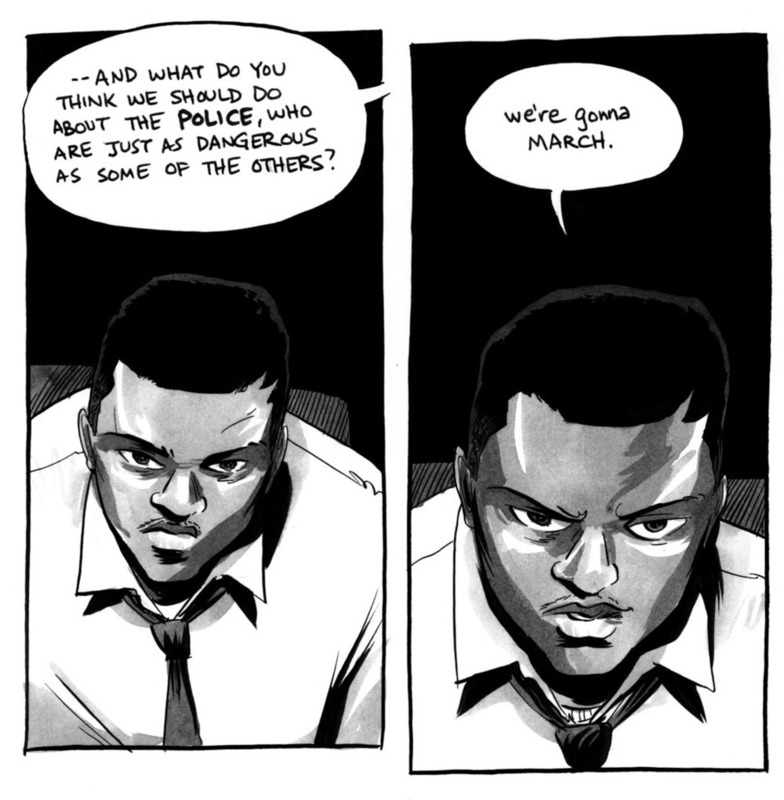 Congressman John Lewis has written MARCH, a graphic novel series about his remarkable life, to teach civil rights history to a new generation of Americans. March: Three received the 2016 National Book Award on November 16, 2016. The MARCH Civil Rights Education Project is actively working to have the MARCH books and a companion teaching aid adopted in schools and colleges nationwide. Since many school districts have suffered budget cuts that make it impossible for them to afford the MARCH books for their classes, we are calling on you to help support this important project. Together we can make sure that American students know their history so we can stop repeating it. In light of recent protests in Ferguson and Baltimore and the mass shooting at an African-America church in Charleston, this effort to advance civil rights education could not be more important or timely--inspired by the man who is one of our leading civil rights leaders and our national conscience for justice and equal rights. 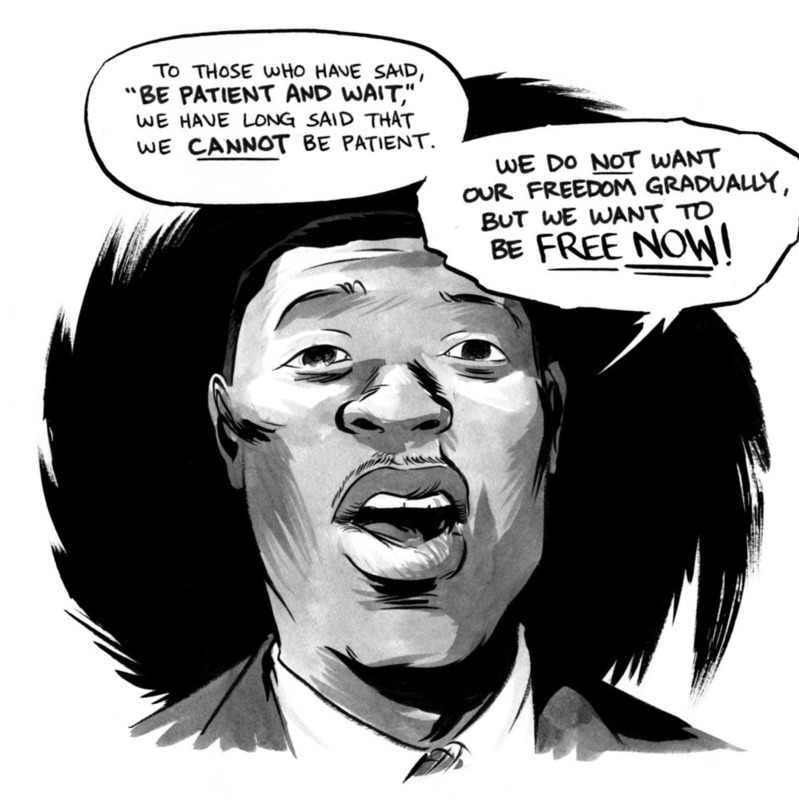 Just as a young John Lewis drew inspiration from the 1950's comic book “Martin Luther King and the Montgomery Story,” his own graphic novel, MARCH, is engaging a new generation to learn about the past and help build a better future. 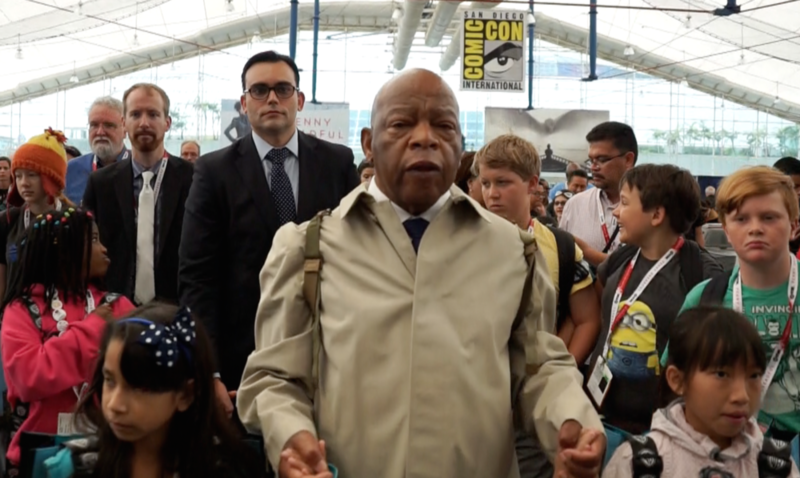 Congressman Lewis and his co-authors have written three highly acclaimed graphic novels about the 1960's civil rights movement - MARCH: Book One, MARCH: Book Two and 2016 National Book Award Winner MARCH: Book Three - that bring the civil rights movement to life for young readers. Book One covers Lewis’s early life through the sit-ins and Freedom Riders. Book Two continues his story through the March on Washington. Book Three focuses on the Selma-to-Montgomery March. "ESSENTIAL READING...MARCH IS A MOVING AND IMPORTANT ACHIEVEMENT." "LEWIS'S GRIPPING MEMOIR SHOULD BE STOCKED IN EVERY SCHOOL AND SHELVED AT EVERY LIBRARY." Already, major universities including Michigan State, Georgia State and Marquette have selected MARCH for their campus-wide reading programs (with over 15,000 first-year students reading and discussing the book), while organizations such as the Mississippi Center for Justice and the Philadelphia Free Library have funded the free distribution of this graphic novel to thousands of students. MARCH has received a Coretta Scott King Book Award by the American Library Association and became the first graphic novel ever to receive a Robert F. Kennedy Book Award. A New York Times bestseller, it was named one of the best books of the year by USA Today, The Washington Post, The Boston Globe, Publishers Weekly, Library Journal and many other publications. MARCH: Three has received the 2016 National Book Award, the first graphic novel ever to do so. Authors Nate Powell, Rep. John Lewis and Andrew Aydin stand near the symbolic Edmund Pettus Bridge near Selma, Alabama. We are asking for your donation to fund bulk purchases of MARCH to distribute to needy schools, colleges and youth organizations nationwide. The MARCH Civil Rights Education Project is an effort to encourage foundations, non-profits, law firms and other like-minded organizations to fund the purchase of MARCH, at sharply discounted prices, to provide for free to disadvantaged schools and youth groups. All donations are tax-deductible, with funds strictly managed by a respected fiscal sponsor, the Mississippi Center for Justice, a non-profit 501(c)(3) entity that is committed to advancing racial justice. The Mississippi Center for Justice manages these funds solely to advance the Project’s purposes. The Project’s primary book distribution partner is First Book, an established non-profit whose mission is to provide disadvantaged children with new books. First Book has distributed more than 100 million books and educational resources to schools serving children from low-income families throughout the United States. This partner arrangement minimizes the Project’s overhead costs and ensures sound and efficient storage and distribution of the books. The MARCH Civil Rights Education Project pledges to provide full fiscal transparency, and will provide periodic accounting of Project expenditures to interested donors. The Project does not employ any staff, to keep costs at a minimum. The book’s publisher, Top Shelf Productions, has negotiated discounted bulk-purchase costs with First Book, to maximize the buying power on behalf of Project donors. Congressman John Lewis, an icon of the civil rights movement, has dedicated his life to educating the next generation of young Americans about civil rights. His commitment to justice and nonviolence has taken him from an Alabama sharecropper’s farm to the halls of Congress, from a segregated schoolroom to the 1963 March on Washington, and from receiving beatings from state troopers on the Edmund Pettus Bridge to receiving the Presidential Medal of Freedom. 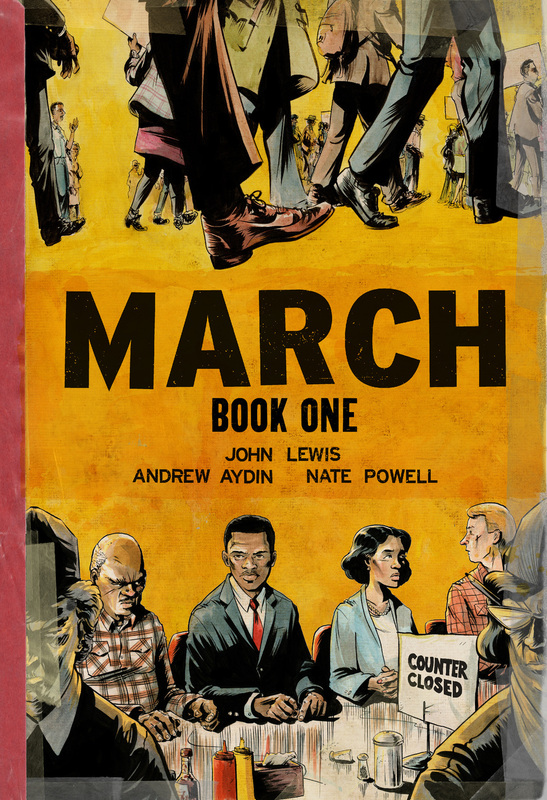 Congressman Lewis, co-author Andrew Aydin and artist Nate Powell have written MARCH to inspire readers to carry on the powerful tradition of nonviolence and to be a tool to help students understand the civil rights movement and the rights it helped to secure. Black and white photo of Congressman John Lewis at Edmund Pettus Bridge photographed by Spider Martin. The March Civl Rights Education Project has formed partnerships with non-profit organizations to efficiently distribute the MARCH series, and a companion teaching aid, to needy schools and youth organizations at the lowest cost possible. The Mississippi Center for Justice is a non-profit 501(c)(3) organization that is committed to advancing racial and economic justice and to providing better futures for low-wealth Mississippians and communities of color in the areas of educational opportunity, financial security, access to healthcare, affordable housing and community development. The Center has provided more than 3,500 copies of MARCH to students in 16 schools in Mississippi, including disadvantaged schools in the Mississippi Delta. The Mississippi Center for Justice is also serving as the Project’s fiscal sponsor, serving as a central repository for all tax-deductible donations to the MARCH Civil Rights Education Project. The First Book non-profit organization in Washington, DC, provides access to new books for children in need. To date, First Book has distributed more than 135 million books and educational resources to programs and schools serving children from low-income families throughout the United States and Canada. First Book is transforming the lives of children in need and elevating the quality of education by making new, high-quality books available on an ongoing basis. To keep costs low, the MARCH Civil Rights Education Project is working with First Book to distribute the MARCH series to deserving schools and youth organizations nationwide. Photo of Congressman Lewis with Rev. Martin Luther King during Selma-To-Montgomery march photographed by Steve Schapiro. Photo of Congressman Lewis and Martin Luther King meeting President John F. Kennedy Jr. photographed by Warren Keffler. Photo of activists marching to promote freedom march courtesy of Alabama State Archives. The March Civil Rights Education Project.